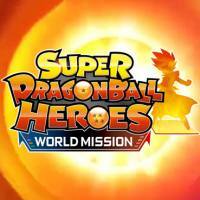 Super Dragon Ball Heroes: World Mission is a digital card game in which you can find characters from the popular Dragon Ball universe, known for its manga and anime by Akira Toriyama. The title includes Goku, Vegeta, Xeno and Jiren - the full list of characters has more than 350 items, and the total number of available cards exceeds one thousand. Bandai Namco Entertainment is responsible for the creation and release of this production. The action of the game takes place in an alternative reality, in which powerful warriors used to be active and are now treated like heroes. However, Capsule Corporation has developed a special technology that allows them to use their powers in the Super Dragon Ball Heroes card game. The gamer plays Beat, who arrives in Hero Town - the city where this card game is the most popular entertainment. The boy wants to win the title of champion of this sport. In order to achieve his goal, he will have to form alliances with various heroes. Super Dragon Ball Heroes: World Mission gameplay is about duels and it's no different from what we know from other games in the genre. Before each battle we choose a group of seven characters who will take part in the fight. During the match itself, we put our heroes on the arena, and then we decide on the tactics and skills used. Our warrior's repertoire depends on the cards he holds - they decide about special attacks, special forms (transformations - e.g. Super Saiyan) or equipment. In Super Dragon Ball Heroes: World Mission we can play alone or with others. Those who prefer to play alone should be interested in the Story and Original Mission modes. The first allows you to play a classic fictional campaign, while the second allows you to perform special missions for which you receive prizes (there is also a possibility to create your own, which you can share with other players). As part of the Super Dragon Ball Heroes: World Mission multiplayer game, it offers the opportunity to fight against players from all over the world. Fights can be conducted freely (without any consequences) or within a ranking system, which records our results and allows us to determine the level of our skills. Nintendo Switch players can also use the local multiplayer mode (requires two consoles). Super Dragon Ball Heroes: World Mission has interesting graphics. Unlike many other card games, Bandai Namco Entertainment's binding is not limited to two-dimensional images - we have here three-dimensional characters and arenas, which thanks to the use of cell shading technique resemble heroes and places known from anime. There are also spectacular animations depicting various kinds of special attacks. The characteristic artistic style of this production clearly shows the hand of Akira Toriyama's mangaka.